Not so easy. Try it. While gathering all the images and text for a huge mofo of a book (Ritual America), and assisting with the design and proofing of it all, it’s not easy to find the time to take care of all the other books, too. They’re looking great and we love ’em all! Many have asked for full size reproductions of the innovative, extreme, rare, and exceedingly costly thematic magazines from the Process Church. This limited edition hardcover edition is 9 x 12 in size, and also contains text of The Gods on War, and a free download of the same as read by Genesis P-Orridge, Timothy Wyllie, Lydia Lunch and Adam Parfrey. All Banksy fans out there know that this creative self-promotional genius has taken tagging and spray-painting to the next level. 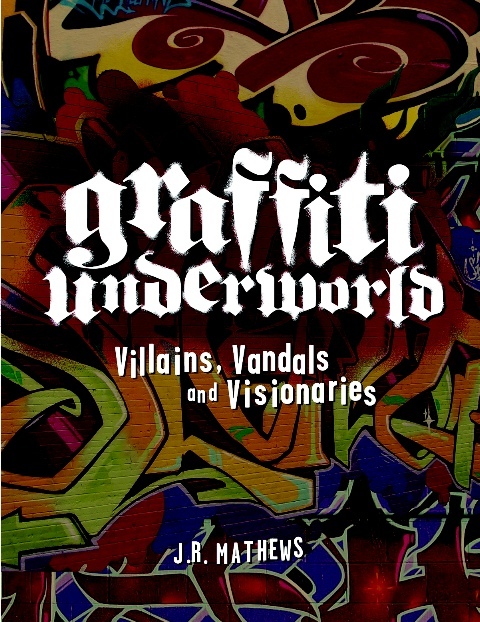 Graffiti Underworld explores the often dingy and violent universe of the tagger vandal and their confrontations with cops and fellow vandals of boxcars, trucks and buildings. Author J.R. Mathews interviews and photographs a couple hundred of them, and you’re not going to clearly see any faces, but the results are evident throughout in full color. These taggers are not going to win plaudits at art exhibitions, but receive high-fives from fellow subterranean wild men.